Our Yammer network is growing by the day and as time passes my excitement about its potential for increasing the speed and quality of collaboration, knowledge sharing and innovation across the company rises. So naturally I get very protective when something happens that potentially undermines our continued use of my new favourite application. One of the issues I know causes some discomfort among senior executives everywhere is the issue of trust and confidentiality. So one thing you don’t really want to see on Yammer is open discussion about commercially sensitive information that needs to be kept in a closed loop. After many thousands of conversations and contributions on our network since it was brought to life last year I have yet to see anyone cross this boundary. Actually this comes as no surprise to me. I have long believed that when you trust people to behave appropriately they do. Secrets fuel gossip, speculation & rumour, which quickly spreads around as people who feel excluded and unworthy probe and speculate. This can be very disruptive in any work place – and sooner or later they become open secrets in any event. And because people have no stake in them (and they only have half the story) they are far more likely to say or ask something inappropriate in the wrong place at the wrong time. In my experience the more stuff you try to hide, the greater the risk you run of it leaking out. On the other hand, if you treat people as adults and trust them with information, they will repay your trust and respect the need to exercise discretion and moderation when talking to the outside world. Of course there are some things that need to be kept secret. But I think that too many companies have a tendency to overplay the secrecy card – and this can have a seriously detrimental effect on organisational culture and effectiveness. One of the guys at work had a bit of a rant on Yammer a few days ago on this very subject. So we are using Yammer where I work. I like Yammer a lot. Mainly because the basic functionality is free and therefore gives me the chance to experiment without spending a bean. The technology is fine and it sure beats email as a way of threading conversations across the company and in work groups. We never officially launched Yammer, and yet around 15% of the company (244 people) have found their way to the site and registered in a matter of months. I was initially disappointed that despite going to the effort of joining the network, most people do not appear to use it. Analysis of the contributions to date reveal that 5% of the users (12 people) are responsible for just under 60% of the content and 50% of the content is generated by just 6 people. Then I discovered Jakob Nielson’s theory of Participation Inequality. In short, Nielsen’s theory, otherwise known as the 90-9-1 theory, is that in most online communities, 90% of users are lurkers who never contribute, 9% of users contribute a little, and 1% of users account for almost all of the action. 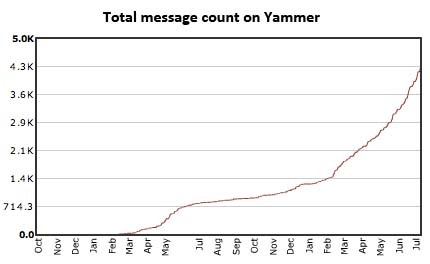 On this basis, our Yammer figures look quite respectable. So I took a quick look at Wikipedia, and discovered from their latest figures that that a mere 0.13% of users (85,000 people) are active contributors against 64m unique users. And I took a quick look at Twitter, where recent figures suggest that 5% of users account for 75% of all activity. I feel much better now! The next step is to try and work out whether the lurkers are deriving any benefit….